When it comes to mountain bike riding, the right mountain bike gear can make all the difference. From your helmet to your bicycle itself, you want to make sure that all your mountain bike equipment must have so you can get the best riding experience. While other mountain bike gears such as helmets, lights, and gloves get all the attention, what about your bike pedals? If you’re riding on rough terrain, you don’t want your feet to slip off the pedals and potentially cause an accident. That’s where clipless mountain bike pedals come in. These handy devices lock in your feet, so you stay in position no matter what happens. Today I’ll be talking about the best clipless mountain bike pedals, as well as what to look for when buying them. 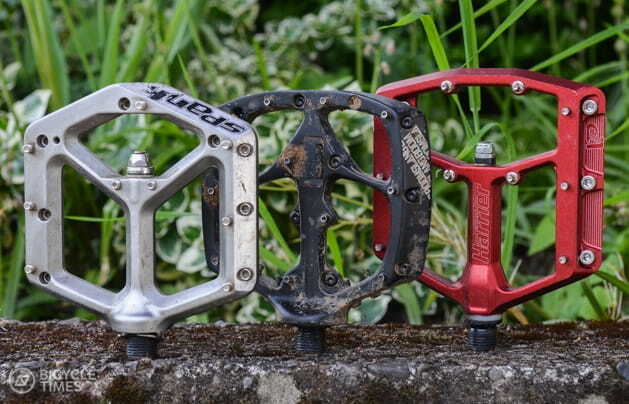 Below is a list of five top-rated clipless pedals. Each model is high-quality and built to last, so you don’t have to worry about replacing it anytime soon. First on our list is the Diamondback Overdrive Mountain Bike Clipless Pedals. These bad boys are heavy-duty and made for rough terrain. The first thing you’ll notice. About these pedals is the slick chrome construction. The first thing you’ll notice about these pedals is the slick chrome construction. Although after a harsh ride they may not look as pretty, the chrome does help to keep these pedals in tip-top shape. The chrome also makes these pedals super lightweight, only coming in at 295 grams. The best part about these pedals is the fact that they also come with cleats, so you don’t have to find the right shoes to lock in. Finally, this model is also double-sided, so you don’t have to make sure you’re on the correct side before you head out. When looking at clipless mountain bike pedals, there is only one company that is synonymous with this piece of equipment. That company is Shimano, and they were one of the first to come out with Shimano clipless pedals back in the early nineties. Being the first they have been developing pedals for decades, so you know that any equipment with the Shimano name is high-quality. That being said, the first Shimano pedal on our list is the PD-M530 SPD clipless pedals. These sleek, all-black pedals are built to last, with a sturdy chrome-moly construction. The bearings are also sealed, so you don’t have to worry about them coming off while riding. Like the Diamondback pedals, these are double-sided and have adjustable tension control so you can customize the release to meet your specifications. As far as weight, these pedals come in at a moderate 455 grams. While not as light as the Diamondback, they are much more robust and will take a beating. Next on our list is the Shimano PD-M324 SPD Dual Platform Pedal. As I said, Shimano is pretty much the gold standard when it comes to clipless mountain bike pedals, and the PD-M324 is no exception. There are a couple of significant distinctions between these and the M530, the first of which is the fact that these are not double-sided. While that may seem like a downside, the fact that the M324 can work as a clipped or clipless pedal helps alleviate that setback. The other benefit of being one-sided is that you can ride without having to wear cleats. The flat side is perfect for street shoes if you plan on doing any casual riding. Like the other pedals on this list, the M324 comes with cleats, so you don’t have to worry about finding the right pair of shoes. Finally, this model weighs 1.17 pounds, making it the heaviest set so far, but not too much so to make them cumbersome. So far, the Shimano PD-M520 MTB SPD Clipless pedals on this list have tried to appear ergonomic with sleek designs and chrome or aluminum construction. This next set of pedals, however, does not try to impress anyone with looks and instead opts for rugged dependability over style. The Shimano PD-M520 MTB SPD Clipless Pedals are the Jeep of the clipless pedal world. They may not look cool or sleek or flashy, but they are built to do their job well and take a beating in the process. While these pedals are a bit bulky (they also weigh just over a pound), they will strap your feet in and deliver a perfect performance every time. These are rated as sports pedals, so they are built to withstand the punishment that would cripple other sets of pedals. The M520 set is also designed to wick away water and mud much easier and more efficiently than other pedals in its class. Overall, if you’re looking for a workhorse of a pedal, the M520 is for you. Finally, we come to the Shimano Clipless SPD Pedals. If you’re looking for just a basic clipless pedal that can help you stay on your good bike during a rough ride, the PD-1780 pedal is for you. 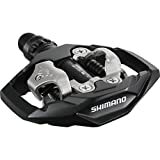 These are about as simple as clipless pedals get, but since they are from Shimano, you know that they are still as durable and comfortable as possible. Like the M324, these pedals are one-sided, which make them perfect for both mountain biking and street riding. This model also features reflectors for added visibility in low light conditions. Unfortunately, they do not come with cleats, but I do believe they are compatible with any Shimano SPD style cleat, making them ultra-versatile. If you’re new to the clipless mountain bike pedal game, it can be a little bit confusing to pick the right one. Here are some of the most important factors to consider when choosing a clipless pedal. While weight is not necessarily a deal-breaker, it is an important thing to consider when picking out your pedals. Some models are super light and only weigh a fraction of a pound. Others are more heavy-duty and can weigh almost a pound and a half. Personally, I find that a heavier pedal feels better on my feet since it makes the entire piece feel more durable. However, if you’re opting for speed and aerodynamics, a light pedal may be the better choice. As with all biking equipment, you want to get the best gear at the lowest price possible. Pedals are not that expensive in general since they are such a simple device. However, you have to keep in mind that you may need or want to switch between pedals if you do different kinds of riding. Also, some of the higher end models can cost over a hundred dollars, so they can be a bit of an investment. When choosing the right clipless pedal for your needs, first determine the kind of riding you will be doing. 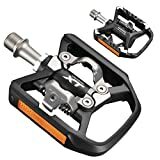 If you are mostly biking on rough terrain and need to keep your feet locked in, then it may be best to choose a pedal with double-sided clips, so you don’t have to make sure the pedal is facing the right way. However, if you also plan on doing casual street riding in regular shoes, you may want a pedal that has a clip on one side and a flat surface on the other. Additionally, some pedals work as a clipped or clipless pedal, so make sure which version you want before you buy. As with all parts of your affordable bike, you want to make sure that the pedals you purchase are as rugged and durable as anything else. Since you’ll be putting the pedals under extreme stress, you want to make sure that they are made of high-quality metal and will last for years. Shimano pedals are all highly rated regarding durability, but this is also where weight can come into play. Heavier pedals are usually a bit sturdier and more robust than lightweight pedals. However, that being said, there are some lighter models out there that are just as tough as any heavy pedal. When choosing the right pedal for you, take into account both the weight and the type of metal used to determine how durable the unit will be. The most notable thing about use clipless pedals is the fact that you have to wear cleats for them to work. Otherwise, the pedals have nothing to lock into, making them ultimately worthless. Most pedals do come with cleats, but you want to make sure what type of cleats they are. There are two distinct variations of cleat: walkable and road. As the name would suggest, walkable cleats are designed so you can walk around in them without any discomfort. The clip is embedded into the sole for a beautiful, flush surface that makes the shoe feel like a regular street shoe. The downside of this type of cleat is that it can get clogged with mud and dirt, and it can be a little harder to clip into the pedal. Road cleats, on the other hand, are much lighter and have the clip sticking out of the sole. These cleats are not meant for walking around, and if you try doing so, you’ll quickly see why. Some road cleats do have a rubber covering to allow you to walk normally, but most models do not have this option. The benefit of road cleats is that they are usually easier to clip on and are designed for speed and aerodynamics. When looking at all of the clipless pedals available, it depends on the kind of riding you’ll be doing. Personally, I prefer a heavier, more rugged pedal for my rides, so I would choose the Shimano PD-M520 for my needs. However, the downside of that is that I have to switch pedals for when I go street riding, so that is a bit of a hassle. If you want a more versatile pedal, I would suggest the M324 model since it works as both a clipped and clipless pedal, and it works with mountain biking or street riding without having to switch pedals. Overall, however, you can’t go wrong with any Shimano pedal, so it really will come down to personal preference.